It is not a secret but one of my favorite places to be is right here, 18 miles away from where I live in Northern California. The place? Mission Peak Preserve which is located in eastern Fremont California. The most popular access point is at the end of Stanford Avenue off of Mission Boulevard. Mission Peak is part of the Diablo Range which extends south all the way to highway 46 near Paso Robles. The northern portion of this range includes Mt. Diablo, Sunol Peak, Mission Peak, Mount Allison, Monument Peak. Farther south and east are a number of even taller mountains including Discovery Peak, Mount Isabel, and Mount Hamilton. Still farther south the Pinnacles National Monument lies in almost the center of the entire range. Where should I go for the best pictures? Who can I go with? 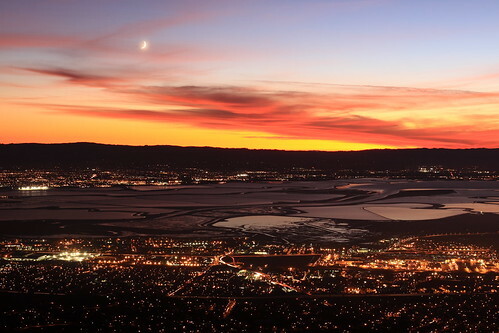 Photo 4: Mount Allison and San Jose, California glowing in the pre-dawn light. How Long Does it Take To Hike Up? Now that is a tough one. You might as well ask me “Steven, how many pounds can I lift?” or “Steven, how far can I hit a golf ball with a 5 iron?” The answer, of course is I do not know. How fit are you? How much hiking have you done? What are you planning to carry? While Mission Peak is literally a walk in the park, it is definitely not the colloquial walk in the park. The East Bay Park District guideline says it takes up to 5 hours to reach the summit and return. For some people that may be optimistic. It is a STEEP hike. Mission Peak rises 2,517 feet above sea level, and the longest trail to get to the top from Ohlone College, is a little over 3 and a half miles. The steepest trail – Horse Heaven trail from Stanford Avenue – is a little under 3 miles. Walking 3 miles on flat ground is easy for most people to do in about 45 to 60 minutes. When I carry my 20 pound pack with camera gear, water, extra clothing, first aid kit, flashlight, etc. it takes me about an hour and 40 minutes to reach the summit and about 50 minutes to descend. When I’m feeling fit and traveling light I’ve reached the summit in 55 minutes. I have friends who can run to the top in less than 30 minutes. I have other friends who, I fear, will never reach the summit. Hard. See above. For me, as for most people, going up a steep incline is daunting. People tackle this in two ways: set a slow pace and keep it. Or go at a faster pace and rest when necessary. I prefer the latter. This hike is hard enough that I use Mission Peak as training prior to my summer backpacking expeditions into the high Sierra. If I can summit Mission Peak twice in one day I know I can conquer Half Dome in Yosemite. Mission Peak is shorter and at a lower elevation but it is steeper than Half Dome. My best advice is to try hiking Mission Peak. And when you try, be well prepared. See “What Should I Bring” below. The last 1/4 mile of the trail climbs about 700 feet over sometimes slippery rocks. Good footing is important. I do not think anyone – even the acrophobic will find the trail scary. Unlike Half Dome there are no sheer ledges to fall off if you stay on the trail. By the way, there is no shame to not reaching the top. The views are excellent once you get past the first bench. TIP: When walking up, use that big muscle (your buttocks) to pull you up – your calves and thighs will thank you. Also, while traveling up can be exhausting, coming down can be downright painful. On the way down you are much more likely to slip – especially in bad shoes – and the pounding on the knees and ankles is quite noticeable. You are also likely to notice your quadriceps complaining. They will be doing work they are not used to. Layers of clothing – including WARM clothing and windbreaker. It can be cold and windy at the top – very cold and very windy. A cap or wide brimmed hat, knit hat and light gloves – yes, even in the summer. Insect repellent is usually not necessary, but might be a good idea as there are ticks. Flashlight or headlamp – even if you do not plan to be there when it is dark. Moleskin or glacier ice (for preventing or managing blisters) and a knife or small scissors if not precut. (Optional) A camera and a tripod. If you’re not taking a tripod you’re not going to get the best pictures, trust me. How Should I Get to the Summit? Horse Heaven trail – the steepest but also the best views and the most varied terrain – and the least traveled by park goers so there is more solitude. Start at Stanford Avenue and take the first fork in the road down and to the right (here it is called the “Peak Meadow Trail”). This trail has a few locations where you can miss a turn so make sure you have a map. The most common mistakes are to take the very steep shortcut too soon or to miss the switchbacks which exit Peak Meadow Trail and become Horse Heaven trail. The Peak Meadow Trail makes a wide 180 degree turn to the left, but before you exit that elbow you must head up the Horse Heaven trail which is easily overlooked if you keep following the fire road. The Horse Heaven trail joins the Peak Trail on the southern side of the Mission Peak summit closest to Mount Allison. After paying a penalty going up some mercilously steep sections (with a few down segments) getting to the summit involves a kinder, gentler, slip free ascent to the Mission Peak summit. The Horse Heaven trail crosses very small streams about 3 times. Ohlone College trail (properly called the Peak Trail or the Bay Ridge Trail) is the easiest and the fastest route to get to the eastern wilderness side of the preserve. Easiest because it is the longest thus the least steep – not easiest as in easy. The Ohlone trail is interesting because a segment of the trail goes through a wooded section where you are very likely to see or hear a rafter of turkeys. Except for the wooded section, the trail is mostly a fire road. Parking on Mission Boulevard is your best choice. If you park in the college, do not forget to pay! The “main trail” from Stanford Avenue is where the masses of people aimlessly go. It is the most obvious route and for me, the most boring. The trail (called the “Hidden Valley Trail”) is a fire road that winds its way up to the northern shoulder of Mission Peak. The road is pretty well maintained and drained. From the North shoulder a long scramble (not climbing!) up rocks is in needed to reach the summit OR you can follow the trail around the backside of Mission Peak past Eagle Springs Backpacking camp and then ascend on the easier southern side of the summit. There is almost no shade anywhere along this trail. I have never taken the trail up from Sunol Regional Wilderness, but it is long and connects to the backside of Mission Peak. While standing on the summit is a psychological boost, many people do not realize that the summit is NOT where the marker pole is. 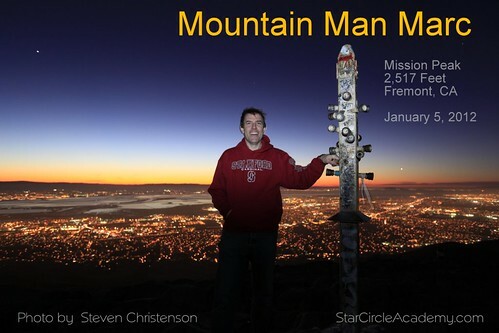 Also Mount Allison and Monument Peak are both taller than Mission Peak. Mount Allison is the next peak to the south with lots of radio towers on it – the summit area of Mount Allison is private property, but the trail does go around it on the way to Monument Peak. 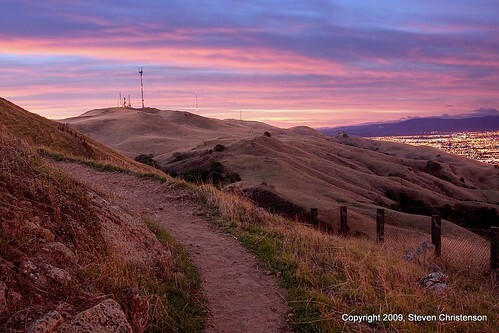 It is possible to hike across Mission Peak, to Monument Peak and down into Ed Levin park. Where and When Can I Get the Best Pictures? If you are reading this thinking I am going to tell you… wrong! There are thousands of great spots and any time of the day or night presents great opportunities. You may notice I prefer sunrises, sunsets and night time. There are practical and photographic reasons why I prefer those times. The practical reason is that it falls outside my normal working hours, and the mornings and early evening are generally cooler than mid day and mid afternoon. Early morning and early evening parking is more plentiful, too – except on weekends when huge throngs of humanity take on Mission Peak. There is more to see than landscapes. There are turkeys, raptors, vultures, ground squirrels, coyote, cows (lots of them! ), mice, deer, snakes (including rattle snakes), toads, frogs, lizards, and a variety of flowering plants including lupin, mules ears, venus thistle, clover, butter cups. There are two seasons: the cool lush green season, and the dry brown season. Both have their charms. People worry about a lot of things which I think are a waste of energy. People worry about cows and snakes, for example. Both are docile. People worry about seeing or hearing coyotes. Really, they’re harmless. I suggest worrying more about good shoes, having layers of clothing, plenty of water and being prepared in case you or someone you meet up with needs attention due to a slip or a fall. And inspect yourself for ticks after a hike. Ticks tend to be abundant where the cattle hang out and Lyme disease is much more sinister and much more likely than a rattle snake bite. There is poison oak in a few spots – none that I’ve seen on the main trail, but some along Horse Heaven and the Ohlone College trail. I wouldn’t spend much time worrying about getting lost either. Almost the entire mountain side is open so it is usually easy to see where you need to go even when its not obvious which trail is the correct one. On the other hand vulgar and rude people are not that uncommon. Cell coverage is extremely spotty. Full bars in one spot and no bars 3 feet from that spot. There is no water on the trail – only at the beginning. There is also a permanent pit toilet at the north shoulder where three trails meet, and at the trail head at Stanford Avenue. Oh, and worry about car breakins! There have been many. Leave your valuables out of sight or not in the car at all. I regularly schedule photography hikes with a limited number of participants through the Bay Area Night Photography Meetup. In each I post my planned hiking speed. Please do yourself a favor and know your speed if you plan to join. Often I plan these hikes to arrive in place near sunrise or sunset and slowness means missing the best light. The San Jose Hiking Meetup also regularly tackles this summit. They are hikers whose goal, remember is to HIKE for health, fellowship and enjoyment. They are a fun bunch and I always enjoy their company (in part because I have never heard any of them whine about how difficult the hike is). There are other Bay Area Hiking groups, too. Or just recruit a friend and try it first on a weekend when you have plenty of time. I generally do NOT go on weekends. Too crowded and too many other great places to go. NOTE: If you have somebody who will drop you off you can massively cheat. Study the maps and you will notice that Mill Creek Road connects with the Peak Trail at 1200 feet. That’s almost half way up – but there is NO parking on that road. Expect a ticket and a tow if you try to park there! If you do not see the answer above and cannot find it on the Mission Peak site, use the comments to ask a question. This entry was posted in Photo Tip, Travel and tagged hiking, light pollution, Mission Peak, mountains, night photography, Night view, preparation, San Francisco Bay, travel on April 3, 2011 by Steven Christenson. 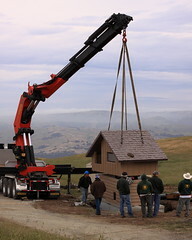 On May 25, 2011 the two porta-potties on the northern shoulder of Mission Peak were replaced with a shiny new permanent structure. No, I wasn’t the first one to use it! 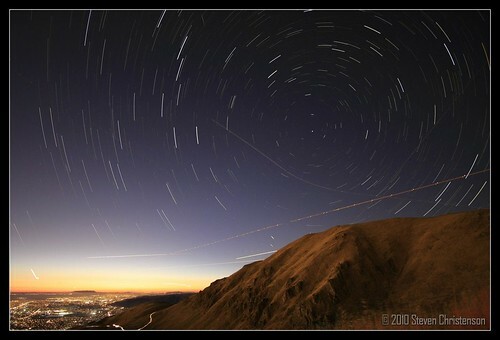 Best blog about mission peak. Answers all my questions . Appreciate you taking time in doing this . Thanks a lot. Love the photographs. Cattle are docile much of the time. However, there are two times you need to be very careful. First, anytime you come between a cow and her calf you are in immediate danger. Cows are very protective and you can be knocked down and trampled without warning. Second, those walking near cattle when dogs are around need to be very observant. Cattle will chase the dogs and in the melee, people are sometimes knocked down. A 1,500 pound animal can cause serious injury. Thankfully, they don’t realize how much injury they can do… or we’d all be in trouble! Would you recommend leaving young kids at home…5-8yr old kids. Would it be too difficult? Like adults, that really depends on the fitness of the kids, and your goals. If you’re trying to summit, it’s a lot of carrying of a tuckered out young ‘en. But by all means, take them on a hike and monitor their progress. Helpful information, I am thinking about hiking mission peak with my boyfriend. Were going to make it to the top, HOPEFULLY! You mention there are slippery sections, particularly near top and people slip and fall. Will pair of running shoes be sufficient? Many people do use running shoes, but I wouldn’t recommend them. There are two kinds of slippiness… some slick rocks, and loose gravel on some steep sections. If your shoes have Vibram (or other tacky tread), that should be ok for the rocks, but may not help on the steep gravel areas. And it’s going DOWN that is likely to be the problem.